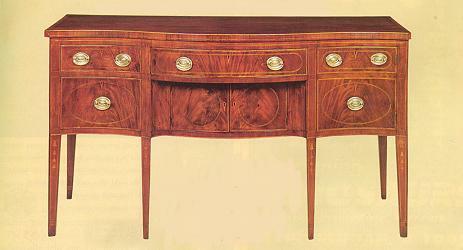 6 Very fine Hepplewhite inlaid mahogany serpentine front inlaid sideboard, with conforming drawers and doors with inlaid stringing and dependent bellflowers, the legs terminating in inlaid cuffs. Maryland, circa 1795. 71" long, 25" deep, 36" high.